Mary T Designs Beadwork: Etsy Beadweavers Challenge Time! This week marks the beginning of the May Challenge of the ETSY Beadweavers Team. The challenge entries are wonderful as usual and are pictured in collage to the left. 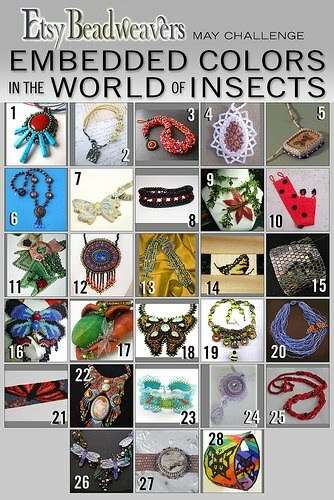 The challenge theme for May was chosed by Isabella at bead4me http://www.etsy.com/shop/bead4me, colors embedded in the world of insects. My entry in the May challenge is my Ladybug, Ladybug Bracelet. I have taken this month's theme literally and the fun peyote bracelet pictured below is the result. The beadwoven spots "float" on a two-toned red peyote base, and this is only one of the many entries. To more closely view the lovely pieces entered in this challenge, please visit http://www.etsy-beadweavers.blogspot.com/s.blogspot.com/. While there, cast your vote for your favorite beadwoven piece. The voting begins today and runs through May 15. Our talented members have created these pieces for your pleasure and would appreciate your vote of approval. You won't be disappointed by the beautiful and intricate pieces on display! While perusing the lovely works available on the ETSY network, I stumbled upon a piece that is both whimsical and beautifully crafted. 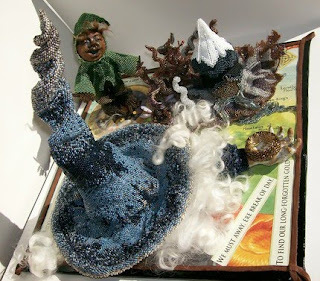 Aleta Ford Baker of takingshape https://www.takingshape.etsy.com/akingshape.etsy.com/akingshape.etsy.com/) has created this wonderful sculpture based on the works of my favorite author J.R.R. Tolkien of Lord of the Rings fame. This particular beadwoven sculpture is based on "The Hobbit". I know the work well and have read it more than a dozen times since I was a teen. I love her interpretation of this fantasy and strongly suggest that you take the time to view it more closely.